All private photos and text are property of author. pertaining to their recovery efforts. My story begins in 1942 in the rural community of Sale Creek, Tennessee. Two poor country boys, actually young men, exercised extremely poor judgment. My 3rd cousin, Jewel C. Maddox, and another fellow decided to find out what riches were contained in a locked railroad car on the Chattanooga/Cincinnati Railway side track. They broke the lock to investigate; apparently witnesses observed their wrong-doing and reported it to law enforcement. After being found guilty by jury, the Hamilton County, Tennessee criminal court judge in Chattanooga, Tennessee gave J C a choice-go to jail or join the US Army. His choice would prove to be a fatal one. He left Sale Creek in August 1942- never to return. Mark D. Alexander, J C's 2nd cousin, was also a young man whose home was also in Sale Creek. He lived next door to the Maddox family then purchased their house after JC left. He was drafted into the military in December 1943; June 1944 found him as a Corporal in the Army/Air Force at Bovington Air Force Station, England. While he was awaiting his assignment in the European Theater he was quartered in a Nissen hut. These olive drab, half-round prefabricated metal structures contained approximately 20 double stacked bunks for 40 men. The interior walls /ceiling were thin plywood; just about every GI scratched his name or something on the plywood; you might see "Kilroy was here" or "I'm sure to go to Heaven, I've spent my time in Hell." As Mark lay on the top bunk he scanned the writings. Scrawled directly above his head was, "J C Maddox, Sale Creek, Tennessee." What a surprise! Mark's wife had written him about two and one-half months previously that JC was listed as "Missing in Action" after being shot down in a B-17 bomber over Germany. In 2007, my father told me about the surprise of seeing his cousin's name that day sixty-three years previously. When I pressed for more information he knew none. J C's father died before JC entered the military service; Aunt Mary, his mother, died while he was in training, and Wilma, his only sister, had married and moved to West Tennessee. Apparently no one ever sought to learn the details of his death. Being a military retiree, I felt it was a travesty that he should just be forgotten; surely there was more to the story. I owed it to J C to find it; he was family. 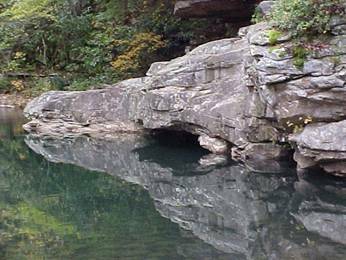 The obscure town of Sale Creek, Tennessee rested along Rock Creek, a tributary from Walden's Ridge running southeasterly to join the Southern bound currents of the mighty Tennessee River. Welsh coal miners settled the town around 1850; after the coal supply petered out almost everyone resorted to logging or farming. John Maddox was a coal miner, carpenter, and laborer; Annie Keith Maddox was a homemaker. Eking out a living during the Great Depression and ten years later was no small feat; the Maddox folks were no different than everyone else-they were poor. John Maddox, of the Maddox family of Virginia had moved to the Marion County, TN coal mining industry, from there they found their way northward to Sale Creek, TN. Annie Keith came with her family along with their Alexander kin; they who were farmers from Concord, a town near Knoxville, TN . Annie Keith married John Maddox about 1921; Jewel C. (JC) Maddox was born on June 30, 1922. Daughter, Wilma, was born July 2, 1926. They lived in a two-room wood frame house with a very small kitchen on one acre of land that was nothing more than an ancient river bed of sand rocks. The old house had been built for the miners when coal was king; you may have heard the song, "Sixteen Ton's." In 1940, John Maddox sold the wood frame house to my father for the sum of $150.00; he died on October 14, 1940; Annie, J.C., and Wilma moved to a rental house. Wilma was fourteen years old but did not attend school; JC had only finished the 6th grade at Sale Creek School. Now he was eighteen and unemployed. Rural life with no education or skills gave JC the incentive to loaf; it was boring but it gave idle minds a chance to daydream and wonder about things. In 1942, JC and a neighbor forcibly broke the lock to investigate the contents of a railroad car on the side track. Apparently witnesses observed their wrong-doing and reported it to law enforcement of Hamilton County, TN. They were soon apprehended, jailed, and ultimately appeared before a Criminal Court judge. He gave JC two choices-go to jail or join the military. World War II had been declared 9 months previously; it did not take him long to make a decision. The other young man only had one arm so he was not eligible for the military; 11 months and 29 days of incarceration would provide him three decent meals each day. JC knew there was no future in jail and he had seen everything around Sale Creek; he chose to join the US Army. My 20 year old cousin was about to embark on a journey that would define his place in history. I began by acquiring his military records; as the only next of kin I was able to obtain three military medals he earned; the European-Middle East Campaign Medal, an Air Medal with one oak leaf cluster, and a WW II Victory Medal. He was also awarded the Presidential Unit Citation Medal, and the Purple Heart which I did not receive. The records revealed a couple of important dates but I was felt there must be more available. Through my knowledge of the military unit structure I went on the internet and contacted his old Bomb Squadron which was a great help. They provided me with his crew assignment on the day of his death; I gained more information on various WWII web sites. Still, I wanted more. I knew of the current MIA/KIA Recovery efforts by teams around the globe; I made a formal inquiry to the Pentagon on May 25, 2007; eight days later I received an acknowledgment and Case Number dated June 1, 2007. On August 27, I received a package (1 ½” thick) from the Office of the Deputy Secretary of Defense. I was overwhelmed; there were copies of all declassified, original German and American records pertaining to Jewel C. Maddox. Each page revealed something about my cousin's hidden history. Perhaps I could finally tell his complete story; putting the pieces of the puzzle together was emotional and satisfying. He enlisted in the Army at Fort Oglethorpe, GA on August 18, 1942. Serial Number 34 365 015 would identify him throughout eternity; he was assigned to the Air Corps with the rank was Private. 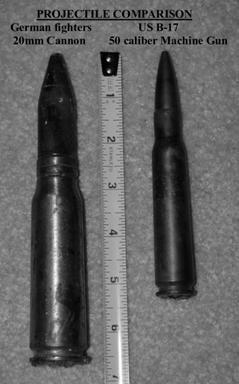 At the age of 20, his profile was as follows: 5 feet 9 inches tall, 129 pounds, brown eyes, black hair, shoe size was 7 ½, and his religion was “Baptist.” October 1942 dental records place him in Gunnery Training at Amarillo, Texas; his specialty was .50 caliber machine guns, the type mounted in the top turret of B-17 bombers. His next training assignment was combat flight engineer for the B-17 Bomber at Geiger Field, Washington. While assigned there, his mother passed away December 27, 1942 but he was unable to attend her funeral. The April 14, 1943 dental charts placed him at Presque Isle Army Air Field, Maine as a "Sergeant." The mission of Presque Isle was to ferry men and equipment to the European theater of war. JC was part of a 10-man crew who flew a new B-17-G "Flying Fortress" to Bovington, England. While awaiting squadron assignment he was housed in a Nissen hut and apparently chose a top bunk. It was there he decided to add his "mark" to the hundreds already carved, scrawled, and written on plywood veneer at Bovington. By chance someone might recognize his name or hometown; he scratched "JC Maddox, Sale Creek, Tennessee" on the ceiling. Special Order 166, Para 3, dated October 23, 1943, JC and ten other men were assigned to the Mighty 8th Air Force, 1st Bomb Wing, 91st Bombardment Group (H) "The Ragged Irregulars." It consisted of four bomb squadrons, the 322nd, 323rd, 324th, and 401st. He became a crew member of the 401st at Station 121 in Cambridgeshire, Bassingbourn, England. His specialty was 748 TTG (Top Turret Gunner) and Flight Engineer. Apparently JC and the Air Corp were a good match; in just 16 months of military service he was promoted to the rank of Technical Sergeant on December 15, 1943. His base pay was $114.00; he received $57.00 flight pay, totaling $171.00 monthly. I'm sure this country boy never dreamed of earning that much at any point in his life time. The 91st flew the largest bomber in the world at that time, the B-17-G "Flying Fortress." Different variants of color were tested; early models were shiny aluminum then came olive drab birds. On March 16th, 1944 the 91st began receiving replacement B-17's with natural metal finish. For in-flight visual identification, the 91st aircraft had a large “Triangle A” painted on the tail and wings of all their aircraft. The 401st ID code was "LL" and painted on each side of the fuselage; the Radio call sign was "MUTTER." Their missions were to bomb designated targets in Adolph Hitler's mainland Germany and its occupied countries. The 401st crew member's jackets were adorned with the shoulder patch at right. Two characters from the Li'l Abner cartoon strip; "Hairless Joe" and "Lonesome Polecat" rode bombs filled with the potent and powerful "Kickapoo Joy Juice." Each of these giants had a wing span of 103 feet 9 inches; a length of 74 feet 4 inches, and a wartime gross weight of 65,500 lbs. This weight was borne by three wheels and tires while on the ground; they retracted when airborne to reduce drag. It was powered by four 9-cylinder, 1,200 hp Wright or Studebaker engines which achieved a cruising speed of over 200 mph at an altitude of 25,000 feet. Armament consisted of thirteen 50 caliber machine guns. In order to accommodate heavier bomb loads, no machine gun carried more than one minute's supply of ammunition-roughly 780 rounds each. The bomb bay had the capacity to carry 12,800 pounds of bombs ranging from 100 lbs to 1000 lbs. making the gross loaded weight (including the crew of 10) approximately 42 tons. The B-17-G carried a crew of ten men; their stations were: 1. Pilot 2. Co-pilot, 3. Bombardier, 4. Navigator, 5. Radio Operator, 6. Top Turret Gunner & Engineer, 7. Ball Turret Gunner, 8. Left waist gunner, 9. Right waist gunner, and 10. Tail gunner. Crew members usually flew together as the "(Pilot's last name) Crew"; however, it was frequently necessary to substitute due to illness or death of a regular member. The crews did not always fly the same plane. Flak from enemy guns and bullet damage from attacking fighters required crews to fly different ships while damage was repaired. Ground crews labored long, hard hours to keep all birds flyable; still, some encountered problems at or just after takeoff. Mission planners always designated "spares"-just in case. Records show that many ships just ferried from the US were shot down on their first mission. "Boeing Airplane Company" could not build new B-17's fast enough during the war. It was rare for a crew or airplane to fly 25 missions then head home to the USA; the Memphis Belle was, and still is, the iconic symbol of such a distinction. Physical size dictated some gunner stations-especially the ball turret on the bottom of the airship was designed for a small man-and one with a lot of courage. To man his station, he slid downward and forward into the ball. A safety belt was adjusted and latched; he donned a chest style parachute then closed and latched the access door handle. Once in the air, he could not see the ground therefore could not determine what direction the plane was traveling; the circular ball track had markings like hands on a clock. If a crew member shouted over the intercom, "Bandits at 2 o'clock", he rotated the electrically operated turret to the corresponding 2'oclock position. The ball turret had stops to prevent the gunner from shooting the four propellers of the bird. If the order was given to "bail out" the gunner unlatched the access door, kicked out backwards, and opened his parachute. If the ship's landing gear was damaged in battle, the surviving crew members did everything possible to extract him prior to landing or crashing. Without their assistance, his name would appear on the Roll of Honor. No one in their right mind wanted that distinction. When flying as a crew member of the B-17, it did not take long to realize the meaning of "dangerous missions." They lived with the probability of death each and every mission; but still, they did their jobs. Many days, only 50% of the hundreds of the bombardment armada returned to base. Some limped back-only to crash upon attempted landing. They helped remove their dead or wounded fellow crew members from their ship. After each mission the crew members were debriefed. They reported everything they saw; the vital information was recorded and preserved. Much of it proved beneficial even after the war to confirm events and aid in recovery efforts. They watched their comrade's planes fall from the sky with wings or tail shot off, engines on fire, and explosions (some due to mid-air collisions with German planes). In-flight damage inflicted by bombs from sister ships flying at a higher altitude and slightly forward in the formation was a reality. Flak and Nazi fighters sent many Fortresses and crews flaming earthward. Some crashed and burned on foreign soil or ditched into the sea or the English Channel. Many airmen parachuted from a doomed plane; some were rescued by Allied Forces, some became Prisoners of War; others were shot and killed by Germans soldiers as they floated to earth. The bodies of thousands of our men were transported home on ships, then trains, and finally hearses to be placed in private, community, public, or National cemeteries. Thousands more were buried with their comrades-in-arms in foreign lands. All-too-many of them still lie beneath the waves of seas or the English Channel; still, others are hidden in muddy swamps. The final resting places of many of our patriot's remains are known only to God; the only remembrance of their life and service is their names engraved in granite stones. These great bombers were vulnerable to the Nazi fighters although our pursuit and fighter planes provided some protection for them. The old Curtis P-40 “Warhawk” had fuel limitations; the Lockheed P-38 “Lightning” was more effective but still did not provide the needed coverage. The newly developed North American P-51 “Mustang”, patterned after the British “Spitfire”, proved to be the answer. It was superior to the enemy in handling, speed, maneuverability, and flew a much longer range. The P-51 and their pilots saved many bombers and crews-often at the cost of their lives. 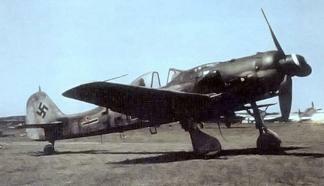 The German Luftwaffe had several capable fighters and bombers; two fighters were the pride of the Nazi regime. The Messerschmitt BF109 with all its improvements had a range of 450 miles at speeds up to 428 miles per hour and a ceiling of 32,000 feet above sea level. A 20mm cannon was mounted through the rotating propeller hub; it also carried two 13mm machine guns. Two additional 20mm cannons could be wing mounted. 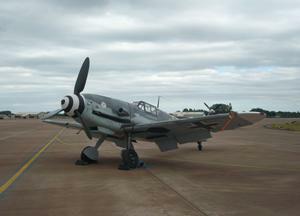 The Focke-Wulf 190, another effective attack fighter, could fly about the same speed with a ceiling of 36,000 feet. It carried two 20mm cannons as well as two 13mm machine guns. Both planes normally carried no less than 500 rounds of ammunition. Many German pilots flying these two aircraft earned the coveted title of "Ace" and medals for shooting B-17's out of the sky. They almost always flew in pairs; a "kill" would not be counted unless there was a witness to confirm it. The crews had mandatory training between missions. Navigation and bombing technique sorties were flown over England; "Link Trainers", which were mock-ups of the real B-17, provided valuable practice. Weather, aircraft recognition, radio communications, parachuting, emergency drills, bailout procedures, and medical training were just some of what they received. They trained as crews and individuals to act as one well-oiled machine in any crew or plane. The 91st averaged a mission every two days. Planes of the four squadrons flew alternately or together, depending upon the location and size of the target. It was the goal of most men to fly 25 missions then go home; many volunteered to fly even more. Each squadron published a "Daily Bulletin," it listed the mission, target, aircraft number and each crewmember's name with Service Number. By March of '44, JC, known as "Johnnie", (apparently he preferred to be called by his father's name) had at least 17 missions. On Jan 27, he was aboard AC 447 with Lt. Beasley on a bombing mission to Wilhelmshaven. On March 6, 1944, the 91st led the entire 8th Air Force bombing raid on Berlin; 69 bombers (6 of the 91st) were lost that day. JC referred to it in an interview you will read later. On March 9 he flew with his assigned crew, that of 1/Lt Julius Anderson on AC 519. He flew as crewmember with Lt's JW Carroll, and Anderson on missions on no less than eleven different B-17's. On March 28 Lt Anderson, JC, and another regular crew member, Beluschak, flew a mission to Reims-Champaign, France with seven crewmembers from another crew. On March 29, 1944, the 91st was briefed on Mission 132; their primary target was fighter/bomber assembly factories at Waggum four miles north of Brunswick, Germany. The aiming point was the sub-assembly plant, the center of the target area. A last resort target was "any military installation position positively identified-and in Germany-that could be attacked without disruption of fighter support. The briefing also identified the locations of our "friendlies"; the US 2nd Division was attacking Watten, Germany. The 322nd would provide six aircraft, the 323rd ten, the 424th ten, and the 401st seven. They would fly at altitudes between 23,000 and 26,000 feet. Each aircraft would carry ten 100 lb demolition bombs and 32 M47 incendiary munitions. In addition, the 324th had one aircraft and the 401st supplied two ships that were loaded identically except they only carried nine 100 lb bombs, 32 M-47 munitions, and one sky marker; I can only assume they dropped the forward mark on the target. Lt. Anderson’s aircraft was designated as 246 in the formation with normal munitions and low in the forward part of the formation. On this mission JC joined Lt. Julius Anderson and 8 other crew members on aircraft number 42-97246. It had no nose art like the famous “Memphis Belle.” The ship had a full compliment of armament: eight 50 caliber machine guns made by Frigidare Division of Gen Motors, two made by Buffalo Arms Co, and three made by High Standard. 1/Lt Joe Grant Stewart Navigator ? 1/Lt James Anthony Graham Bombardier Minnesota ? T/Sgt Joseph Bernard Brennan Ball Turret New Orleans, LA ? T/Sgt Andrew Beluschak Radio Operator ? S/Sgt Charles Edward Clark Left WG Youngstown, Ohio ? The 91st planes departed from Bassingbourn and joined in a pre-designated formation for the long, dangerous journey of approximately 500 miles to the target deep in Germany. Those altitudes required oxygen masks and heavy, electrical insulated suits; the temperature was often 30 degrees below zero. The bomber crews watched the skies; clouds often hid the enemy until the time of attack. The bombers and fighter escorts maintained their headings toward their turn-point and target. They expected flak, anti-aircraft batteries, and German Luftwaffe fighters. German radar had picked up the approaching armada. Low visibility of the primary target dictated an alternate target-Bremen. At an altitude of 23,000 to 25,000 feet the armada completed its “bombs away.” The formation was making a sweeping left turn when they encountered as many as 50 ME-109’s and FW-190’s coming from the east. At 1325 hours, they attacked; our fighters engaged the German craft and dog fights covered the skies. They swarmed over the big bombers like angry bees. Just prior to the target, three determined Luftwaffe fighters looking for a kill lined their sights straight ahead on approaching B-17's. Crew reports after the mission revealed the attacking aircraft were the newest models of FW-190's and ME-109's. Moreover, they were painted silver with red noses and cowlings; they were striped to simulate our P-51 markings. The German pilots knew which area of the plane offered the least resistance- straight ahead facing the bombers. They attacked at a downward angle toward the B-17's nose; facing the minimum number of the bomber's 50 caliber machine guns. They pressed the triggers of their 20mm cannons and their guns belched death and destruction to their foe. "Sir Baboon McGoon", AC # 42-3506, piloted by 2/LT Edgar Downing, was hit. It fell behind with a smoking engine; the pilot managed to "crash" in Holland's flooded polder land. All ten men became POW's. Lt. Evans, pilot of aircraft 116, called for his crew to "keep their eyes on 246" (Anderson’s) as it was lagging behind. Two of Evan's crew had visual contact before they had to engage the attacking enemy aircraft. Debriefing reports from the returning crews were basically consistent. A formation is stacked and flying at different altitudes so everyone could not have seen the same action. They had to remain on course or mass casualties would ensue due to mid-air collisions. Each ship was defending itself and the formation; a lot was going on. Sister ships reports would be invaluable later. Should you became a survivor of a bird going down your memory of the events would paint painful pictures. Statements of surviving crew members provided the chilling details of 246. Pilot Lt Anderson's Fortress was flying in the third lowest echelon of the formation; it came under vicious fire from the three enemy planes. Cannon fire and machine gun projectiles ripped through the plane from cockpit to tail. Co-pilot 2/Lt Gubernat was calling out, "Fighters coming in" and his conversation was cut off; he slumped over the controls-dead. Pilot Anderson was badly wounded and burned on the face and body. The right waist gunner, Sgt Goldberg, was also killed; the German's found a 20mm projectile in his chest. The tail gunner, S/Sgt Seeley, had shrapnel damage to his wrist and was bleeding out. He managed to crawl to the waist of aircraft and went down with the ship. T/Sgt JC Maddox, flight engineer and top turret gunner, was last seen between the dead co-pilot and injured pilot motioning a crew member to bail out. He was wounded and in flames. Lt Graham, the bombardier, 1/Lt Stewart, navigator, T/Sgt Brennan, ball (bottom) turret gunner, and S/Sgt Clark, the left waist gunner, parachuted out of the burning plane; T/Sgt Beluschak, radio operator, managed to bail out also. He was severely injured; his parachute did not open soon enough and his back was broken. He was paralyzed from the waist down; his personal report stated he had bailed out at 500 feet. All five men were soon captured and became POW's (Prisoners of War). The cockpit was a bloody death scene; smoke filled the aircraft; the ship first went into a flat spin- then a spiral. Jewel C. Maddox of Sale Creek, Tennessee was not yet 22 years old but a warrior of 19 combat missions. He was bleeding from the wounds inflicted by the enemy fighter planes; his electrical flying suit was burning-perhaps fed by a ruptured gas line. He surely knew this was "it." Bailing out at that angle of descent was improbable. At approximately 1350 hours the warrior took his last earthly breath. Whether in the air or upon impact, the "Flying Fortress" exploded, and mercifully ended the suffering and lives on board their ship. It was a Wednesday- March 29, 1944. Ten families were notified by telegram or military representative that their loved one was "Missing in Action"; five of them would soon have their worries turned to joy. The other five would spend years wondering and waiting-four of these would never have "closure." JC had listed one Pauline W. Maddox as his “wife.” No one ever heard of her; Wilma, his sister, had no knowledge of her. The US military made many attempts during the next five years to locate her and assist her in receiving all pay and benefits. The Veterans Administration also made attempts but she was never located. This is just one of the several mysteries surrounding JC that will never be solved. While on a weekend pass to London between March 7 and 29 of '44, JC was interviewed by the BBC (British Broadcasting Company). The following is the entire interview which appeared in a Chattanooga newspaper along with the news that JC was “Missing.” Below is a reprint of that article. TSgt Jewel C. Maddox, a Sale Creek youth who told the British about Chattanooga Choo-Choo’s “Track 29” and about his taking part in raids over Germany during a recent British Broadcasting Company weekly broadcast to the U.S. from the American Red Cross Rainbow Corner in London, is now reported missing in action in the European area. Sgt Maddox’s name was included in a War Department Casualty List released Sunday through Associated Press. A verbatim report of the broadcast by Maddox, brother of Mrs. Wilma M. Hardin of Sale Creek, has been furnished the News-Free Press by BBC in London. The interview by Capt. Ken Treadwell of New Rochelle, NY follows: (Q for Question; A for Answer). Q.-Coming up is T/Sgt Maddox. Johnnie, I understand they call you J.C. Is that right? Q.-And where are you from, J.C.? Q.-Say, just the man I’ve been looking for. Is there any “Track 29?” (referring to the song “Chattanooga Choo-Choo)? Q.-What sort of ship are you flying? Q.-Have you gotten any enemy fighters? A.-Yes sir, I have three to my credit. Q.-Hey, that’s a good deal. Three “Jerries” less on account of this man here, how bout that, men? Have you been over Berlin at all? A.-Yes sir. I went over Berlin once. Q.-Where else have you been on your raids? A. –Well, I been over Bremen, Calais, Frankfort. Q.-What’s your most exciting raid that you can remember? A.-Well, I have two that were pretty rough. I’d say the one I hated the worst as when I went to Calais-I had a casualty on my ship. Q.-One of the boys you knew? Q.-That’s one of the hardest parts of this combat flying I’ll just bet. A.-And the most exciting one was-I kind of shook in my pants-was when I went to Bremen, we had one engine shot out over the coast of France. We had another one shot out over the target that was Bremen- that was my first raid. And coming back we had another engine go out just as we hit the English coast. And then, when we were making a final approach for the runway to come in for a landing, we had to make a dead-steep (dead-stick) landing at about 500 feet-no engines. Q.-No engines-500 feet in a Fortress. Q.-Waw! That’s 30 tons sort of coming down. Anybody injured at all? Q.-You certainly had your share of experiences already. Say, by the way, if you ever do see Berlin again-will you do a little job for every man in the room for us? German records place the crash in a swamp area near Neuenkirchen, Germany on March 29, 1944 at 1430 (2:39PM). They identified Anderson’s plane as a Boeing B-17-G 95% destroyed. After the fire had burned out, the remains of Gubernat, Maddox, and Seeley were found. They were identified by personal papers and ID (dog tags)) tags. The five who parachuted from the plane were captured by German forces. During their interrogation, they were shown some dog tags, personal effects and papers of JC Maddox, and letters from Gubernat's wife while he was in still in training. On April 3, 1944, at Evaluation Point West, Oberusel, Germany, the German's turned over the Death Certificates and personal inventories of the initial three bodies found in the B-17 wreckage. Captain Michaelsen, US Commanding Officer received these items. Cemetery records of April 6, 1944 confirm that they were buried in Osterholtz Cemetery, Bremen, Germany. Section K, Row #1, Grave # 1 was 2/LT Gubernat, Grave #2, TSGT Jewel C. Maddox, and Grave #3 S/SGT Seeley. The German's turned over ID Tags to the US authorities for four captives plus Seeley and Gubernat-not those of Maddox. No explanation was given. On April 15, the remains presumed to be of Anderson and Goldberg was recovered from the B-17 wreckage; they were buried April 18 in Graves 32 and 33 in Wesermunde-Geestemunde cemetery in Bremen. On the 21st, the US military received the formal reports; ID tags were not found therefore identification was impossible, however, a passport photo of the unidentified placed in Grave 32 was returned. The captives were questioned and processed; Beluschak was taken to a hospital, Brennan and Clark were taken to an enlisted POW camp, and officer's Graham and Stuart were housed in an officers POW camp. Two days after their ship was shot down, Brennan, Clark, Stuart, and Graham were transported from Oldenburg to Oberursel by express train SF 2212 at 2252 hours. Under the conditions agreed upon January 1943, the captive POW's were transferred to US Command; their freedom was accepted by 2/Lt William E. Newell. No mention was made of Beluschak but it is assumed he was released to the US for hospital treatment. The remains of Lt Gubernat in Grave #1, TSgt Maddox in Grave #2, and SSgt Seeley in Grave # 3 rested in Osterholtz Cemetery for almost seven months. On October 26, 1944, American B-17 aircraft returned on a bombing mission to that area again; a bomb landed between Graves 1 and 5 of Row 1 and Graves 29 through 31 of Row 2. The earth exploded; bits of remains, garments, and caskets were blown to pieces and scattered over a sizeable area. Only two sizeable bone fragments of the four graves were found. The debris was simply pushed back into the crater. In November 1945, the American Graves Registration Command (AGRC) exhumed the graves of all recorded American crew members there. Lt Anderson's remains, identified by the passport photo found at the crash site were in Grave 32. They were transported to Margraten, Holland and buried in Plot UU, Row 11, and Grave 274. After contacting his family, the remains were subsequently returned to the US for burial. 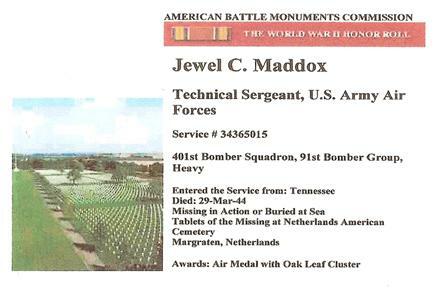 Based upon a written certification by Mr. William Kropp, Wesermunde-Gesemunde Cemetery's caretaker, the remains in Grave 30 were determined to be those of TSgt Jewel C. Maddox. Personal papers had been found on the body. JC's remains were transported to Margraten, Holland. All efforts by the US to locate the widow, Pauline, were fruitless; he was buried in the American foreign cemetery. Remnants of an electric flying suit, a gabardine summer flying suit, and a parachute harness along with a small amount of decomposed flesh were placed in a blanket. The blanket was placed in a casket; an embossed identification plate, TSGT JEWEL C. MADDOX, was pinned to the blanket; the casket was closed then ceremoniously buried in Plot UU, Row 8, Grave 196. German records were full of discrepancies which made quick and accurate identity of remains impossible or questionable. A British Lancaster bomber with 7 aboard had also crashed nearby; their remains were buried in Graves, 33, 34, 35, 36, 37, and 38 (yes, that's only 6). One of its crew members was N.M. Goldberg. Maddox's fellow crew member, Martin Goldberg, was undoubtedly the other body found with Anderson; he had been buried in Grave 33. A US fighter pilot, Herbert Fritts, was shot down in May of '44; his remains were recorded as being buried in Grave 33. The tail gunner of the Lancaster was the only crew member wearing a heated flying suit-like those used on B-17's. When the British Recovery teams were exhuming the recorded grave of one of their airmen, they found three boots-two right, one left. So far, at least two flyers had been buried in Grave # 33 and one Brit apparently had two right feet. The original report given the US specified that JC was buried in Grave 2 in Osterholtz; his was one of the bodies blown out of the ground during the October '44 bombing. On July 5, 1949, Mr. Kropp recanted his certification that he had seen JC's personal papers in 1944. Dulag record KU 1345 confirmed Osterholz, Field K, Row 1, Grave 2 as JC's burial place however captured German "green card" (burials) listed his burial as Wesermunde Cemetery. In 1951 the Army continued to gather more information about each MIA. JC's former crew member, Clark, complicated matters when he wrote that Maddox had been wearing a blue, Royal Air Force-issue heated flying suit and RAF issue boots. When contacted, former crew member, LT Stuart, did not remember any of the crew wearing any clothing other than US issue. Four months later, Clark changed his story; he then stated JC had been wearing a Mae West, a heated flight suit, with a summer flight suit underneath. The AGRC decided to review JC's burial records; they compared the estimated values used in 1945 with his personnel file. After AGRC's review of the confusing records, it determined that the remains in Plot UU, Row 8, Grave 196 were not those of T/Sgt Jewel C. Maddox. That grave was subsequently designated as Unknown X-8018. The final determination was and still is, "the remains of TSGT Jewel C. Maddox were declared non-recoverable." Sadly, the same determination was made for 2/LT Frank J. Gubernat, JR, S/Sgt Aldrich A. Seeley, and Sgt Martin Goldberg. Only 1/Lt Anderson's remains were positively identified. 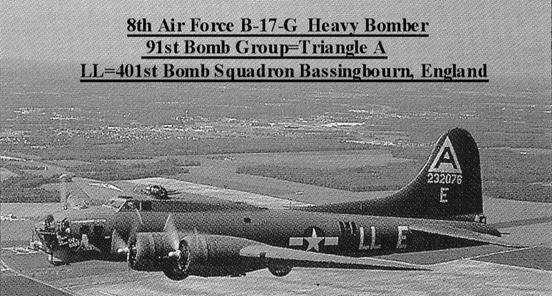 The 91st Bomb Group's records are impressive. During WWII it was assigned over 400 B-17 bombers, flew 340 missions, and lost 197 planes (401st 55). 1010 valiant men died; 887 were confirmed killed (KIA) and 123 are listed as "Missing in Action." 960 of the airmen became POW's. The gunnery training of the crews paid off, too; there were 420 "confirmed" kills and 238 "possible" kills of German aircraft. One more notable achievement was B-17-G "Nine-O-Nine" flew 124 missions without aborting; the ground crews were awesome, too. The 91st flew its last mission on April 25, 1945- over Germany. J C's name appears on the "Tablets of the Missing in Holland; he is also listed as KIA in the American Battle Monument Commission, MACR #3474, the 8th Air Force "Roll of Honor," and the "Honor Roll of Tennesseans Who Gave Up Their Life." The 401st has a memorial in England. The last recovery document was recorded in 1951; the widow, Pauline Maddox, was never found and that case was closed. In 2006, copies of every document were provided to me; I am indebted to and proud of our military system- it has not forgotten any MIA/POW. The details of JC's loss have been added to the case-tracking system maintained by analysis at both the Defense POW/Missing Personnel Office (DC) and the Joint POW/MIA Accounting Command (Hawaii). On September 30, 2009, the "Experimental Aircraft Association" from Oshkosh, WI flew a restored B-17-G bomber to Collegedale, TN. For a substantial fee, they offered a 30-45 minute ride for ten passengers. I rode in the aircraft as a memorial flight to JC. I hoped to get a feeling of what he might have experienced as related to proximity of crew stations and size of the craft. My concentration was on where he and the other nine were, visualizing the incoming strafing path of the machine gun bullets, plus what the survivors who parachuted out saw before they jumped. I photographed the exterior of the bird, the start up, take off, and landing of the first flight, and the inside during my flight. I walked away with a great appreciation and pride for all WW II bomber air crew members-especially Jewel C. Maddox. I doubt if anyone alive remembers JC Maddox; if so, they probably only remember that "he was that boy who got put in jail." I want T/Sgt Jewel C. Maddox to be remembered. I am proud that he is a part of my family; his mother was Annie Keith, a niece of my great-grandmother, Susan Jane (Keith) Alexander. I want him to be remembered in the town he called home-Sale Creek, Tennessee. Hopefully, after reading this, you will appreciate his sacrifice-the ultimate sacrifice for his country. I had a tombstone prepared for him; it rests in my cemetery plot. It is my way of preserving his memory. When people pass by and see his stone I want them ask, "Who is Jewel C. Maddox?" Well, he is a hero! From a petty criminal with only a 6th grade education who exercised poor judgment once, JC became a patriot and warrior. On the 8th Air Force's B-17 Mission Records, it is recorded that he made the ultimate sacrifice for this nation. He was engaged in a battle against the forces of those whose goal was to conquer weaker nations and annilate an ethnic race of people. He never received a "Thank you", a parade, or even greeted by his family or friends; he had no descendants. Yet- Jewel C. Maddox is a hero-who never came home. T/Sgt Maddox earned the following decorations and awards: (1) Air Medal with one oak leaf cluster, (2) Presidential Unit Citation, (3) European-African-Middle Eastern Campaign Medal with one bronze service star, (4) World War II Victory Medal, (5) Air Crew Member Badge, (6) the World War II Lapel Button, and (7) the Purple Heart Medal. Sadly, he never got to wear all of them. When the Air Force Memorial in Washington, DC was in its infant stage, I became a Charter Member. I made a donation in J C's name to insure that TSgt Jewel C. Maddox was included in its perpetual honor rolls. He will not be forgotten. After writing this book, I contacted the Chattanooga Times Free Press chief editor three times in hopes they would print a follow-up story to the one in 1944. They would not! The chief editor, Tom Grissom, told me he felt since there were no remains found there just wasn’t a story worthy of their time and print. I wonder what he thinks of this. At the funeral of my father, Mark Alexander, on June 28, 2009, a military honor guard performed the flag folding ceremony. The minister was asked to explain to those attending the grave-side service that the two names on the other gravestone were being honored also. The military bugler played TAPS and salutes were rendered to honor my great-great-uncle, Pvt. John S. Alexander (CSA), and cousin, TSGT Jewel C. Maddox. J.C. finally received military honors and acknowledgement in his home town of Sale Creek, Tennessee. It was the least I could do for him; at least he received some recognition for his sacrifice. By the way, it was this Mark Alexander who saw the inscription scrawled on the hut wall in England, 55 years earlier, in 1944.